As regular readers know, we often interact with friends of the Dish on Facebook and Twitter. 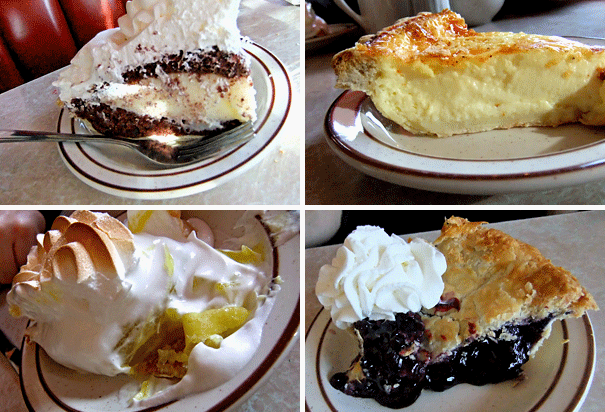 Just before the holidays, one of our Twitter pals, Liz Polay-Wettengel (@LizPW) and her husband Dave (@Kromedome), tweeted us in search of the best pie on the North Shore. 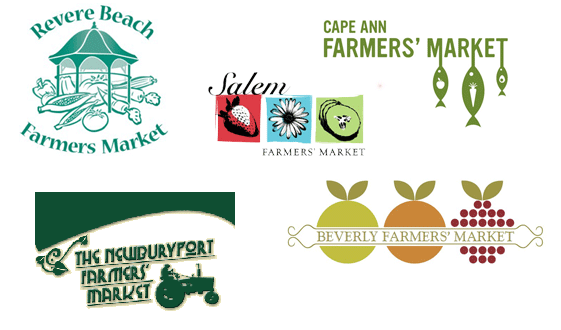 Terrific bakeries abound in the area, but most are known for cakes or pastries. 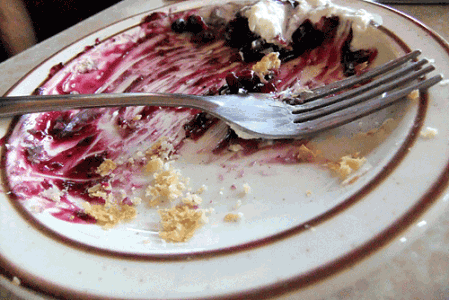 Pie is more esoteric, and we are the types that bake our own, so we were stymied. 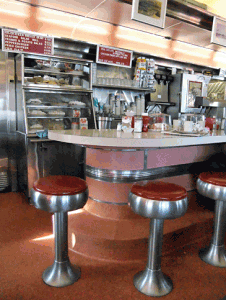 We put the question to the public, and while several suggestions came back via both Facebook and Twitter, the destination most mentioned was the Agawam Diner. Curiosity piqued, we decided this required an investigatory road trip, and asked Liz and Dave if they’d like to join us. Finally able to synchronize our schedules last week, we made the trip up Route 1. 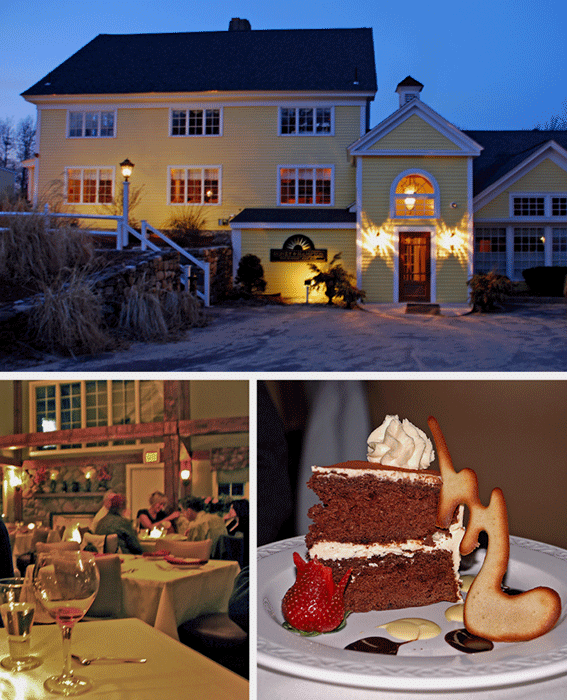 The Agawam has been a family business since they opened in 1940 and has been in its current building since 1954. It’s a terrific vintage dining car with lots of chrome and vinyl, right up our alley. The staff was pleasant and welcoming and had no problem with us staking out a couple of booths till the other half of our party arrived. We sipped coffee and perused the menu and were soon joined by Liz and Dave and their adorable and amazingly polite four-year- old son. We started off with lunch, which was hearty and respectable, but relatively standard diner fare. The coffee was decent, strong enough to stand up to the creamer and good accompaniment for the pie. 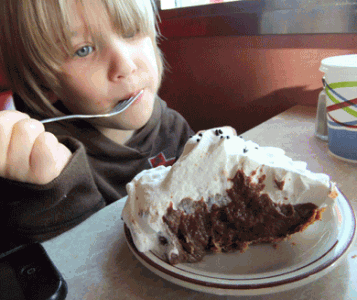 Ah, the pie. Where to start? The selection was staggering. At each end of the diner counter was a large glass case full of pies, and we were invited by our waitress to peruse them after she rattled off a seemingly endless list of varieties. What to choose: banana cream, chocolate cream, lemon meringue, cocoanut cream, custard, apple, blueberry, squash, or something else? The most intriguing was the angel pie, which turned out to be vanilla custard in a dark chocolate cake baked into a pie shell and topped with whipped cream. Yes, you heard it right; pudding in cake in pie. Brilliant concept, and one of our favorites. We ended up ordering various slices ($3.95 each) and sharing all around, so we got to check out an array of tastes. The cream pies were beautiful but so overloaded with whipped cream that we were full after just a few bites. The banana cream was quite good, edging out the coconut, and the chocolate was surprisingly rich. The custard pie was eggy and tasty, and the lemon meringue was served warm from the oven. So warm, in fact, that the waitress was upset it had fallen apart on the plate. She shouldn’t have worried because the warm gooey topping was reminiscent of toasted marshmallow and a perfect foil for the lemon. The blueberry pie didn’t let us down either, sweet and tart with a flaky crust. 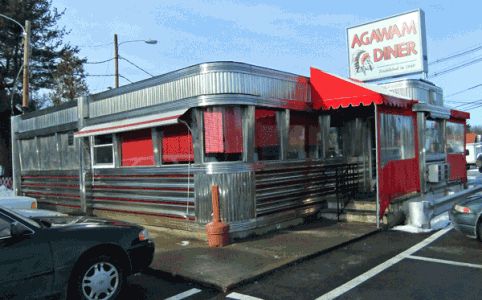 What you have at the Agawam is a near-perfect diner experience. No, these are not gourmet pies. Some of the crusts are better than others, and I’m sure not every ingredient is made from scratch. But they are tasty and hand-made on site, rotated out to the case piping hot and generously served up on heavy china with a mug of coffee by friendly staff. And isn’t that what you’re looking for when you pull off the road at a gleaming chrome diner and sit down at that long formica counter? Thanks to Liz and Dave for inspiring this outing and a reminder to all pie lovers out there; this sunday January 23rd is National Pie Day.